I’m fed up with people that hate on those of us who enjoy running with music. So, I created a manifesto for the music listening runner. A set of beliefs that those of us who enjoy our music while running share and governs our behavior. Just so you know where I’m coming from, my discovery of the this dislike for us began as a result of a lot of the research I did as one of the founders of Rock My Run into what makes runners tick and what running music would best help them perform. Between hours and hours of interviews and extensive online research, one of the things I discovered is what many of you probably already know: There is a split between those who listen to music while they run and those who don’t. What came to light is that there seems to be some harshly negative views of those that like or even love music while they run. I’ve heard people condemn runners that listen to music as disrespectful, clueless and even question their dedication to the sport. I’ll admit that this frustrates and annoys me. While we have all dealt with clueless people on a race course or out running in the streets, I don’t believe that this is related to whether or not they are listening to music. I believe that there are clueless people independent of their music listening habits. I believe that those that are rude on a course don’t represent me and my ability to run with headphones. Once I started thinking about all this I realized that us runners that listen to music need a manifesto; a set of beliefs and principles that define us as a community and can help dispel stereotypes and misconceptions about who we are, why we love our music, and our ability to perform. From there the idea of being a “Run Rocker” started. However I realized that “rocking a run” meant more than just the combination of running and music – it was about passion, excitement and enjoyment. It’s about the joy that comes from completing a goal, from performing well and overcoming obstacles. So with that said here is my first stab at a manifesto for Run Rockers everywhere. See if you agree with me. 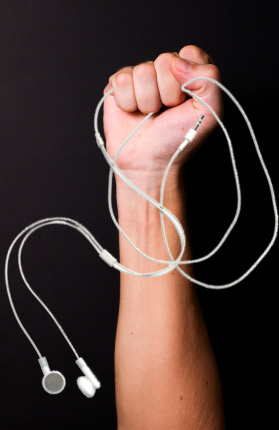 I will at times unabashedly pump my fist to the beat of the music while I’m running if I’m really feeling a song. After all we’re supposed to have a good time with this, right? I can run with music and still pay attention to my surroundings. Not only am I’m talented like that, I’m also smart enough not to crank my volume in the wrong surroundings. Sometimes I will run only with one earphone in if that’s what the situation calls for. I believe that “rocking a run” means not just listening to music while running but giving my best effort during every workout, every training run and every race. I believe that while I enjoy running with music, it is not my crutch. If my iPod dies during a workout or if a race bans music players I can still compete and give it my best. I just may not like the sound of my own panting. I believe that talking during long runs is ok, but don’t get offended if I turn on my music for a bit. Sometimes I just want to zone out and rock with my tunes. I am proud to be a run rocker because it means I am taking on new challenges, stretching myself and becoming a better me. What about you? Are there other beliefs that should be added to this list or taken away? What do you think?